B'Twixt the Ridges Log Cabin is 4 miles from the village of Nashville, situated between two beautiful ridges in Brown County Indiana hence the name. When you see this frontier cabin it immediately says "I'm home". There are wonderful wooded views from all sides of this beautiful cabin on this 6 acre property. With just the right updates, but keeping the country touch, this newly renovated hand hewn log cabin will be perfect for reconnecting with family and friends. The cabin living room has a beautiful wood burning fireplace, a 40" HD flat screen TV with satellite on the mantel, and a queen sleeper sofa. The spacious country kitchen has updated appliances and an 8 person dining table. A TV with satellite can be seen from any place in the room. Watch the day’s weather while making that morning cup of coffee then head out to the spacious sun room with oversized glass doors that open on 2 sides. Enjoy the brick patio or the covered front porch that overlooks the flower garden. A winding staircase takes you to a loft bedroom with a queen bed and a 32" HD flat screen satellite TV with PS2 and DVD player. Relax in the master bedroom with a spacious King size custom log bed, cathedral ceilings and a private bathroom. The master also offers a 32" satellite HD flat screen TV with DVD player. Enjoy a window bench seat to bird watch and read. B' Twixt the Ridges also has a daybed in the study nook that folds out becoming 2 Twin beds or 1 King bed. There is a 2nd full bathroom adjacent. There is added fun for the whole family in the large “Man Cave” game room with window A/C unit. It has its own private entrance and has a full-sized pool table, foosball table, poker table, dartboard and its own 32" TV with DVD player. This cozy cabin has a large private hottub surrounded by woods. Make dinner on the patio charcoal grill and star gaze while enjoying the outdoor Fire pit. 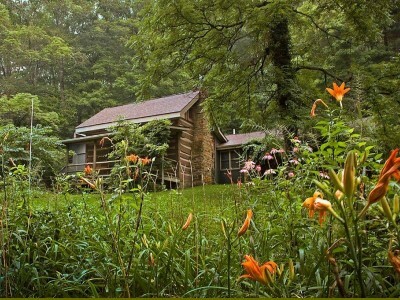 Enjoy Brown County Indiana at B'Twixt the Ridges Log cabin.